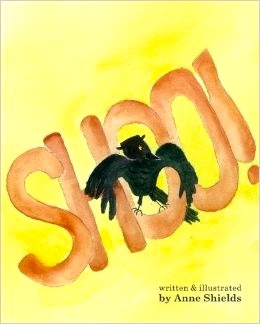 We were all thrilled to learn that Anne Shields has written a second children’s book, Shoo!, which also has her own watercolor illustrations on every page. Shoo is an annoying crow who turns his worst trait into his biggest asset and helps the zookeeper find his shoe (get it? homonyms are introduced to kids). Anne says she had always been interested in writing children’s books. Three years ago she took a class called Children’s Picture Book Writing and–voila–two books! Both Shoo! and Missing Pumpkin (see earlier post) grew out of writing exercises that were part of the workshop. In creating Missing Pumpkin, Anne used a few words from a workshop exercise, including ladder, pumpkin, truck, and a boy named Edgar. Somehow she turned those words into an entire story about an orange cat who runs away to a pumpkin patch. 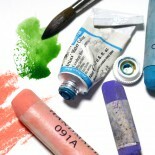 “The hardest thing is getting started, then the imagination comes in,” she says. “Things flow.” Easy for her to say! And she doesn’t even like cats! Another group exercise yielded this concept: What if a shoe blew away in the zoo? From that Anne got a 32-page story about a crow. Go figure. 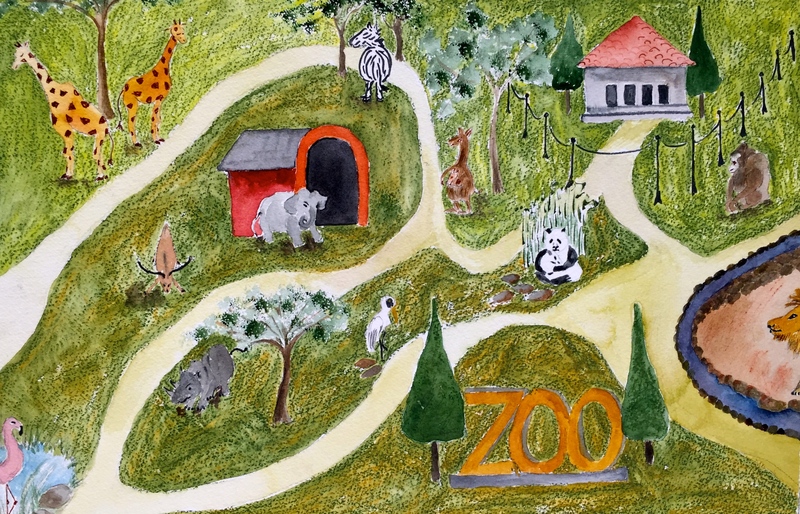 Before she painted the zoo animals for Shoo!, Anne went to the National Zoo to sketch some animals. But they just wouldn’t stand still for their portraits, so Anne gave up the en plein air approach to pandas, giraffes, and monkeys and used photographs as her models. 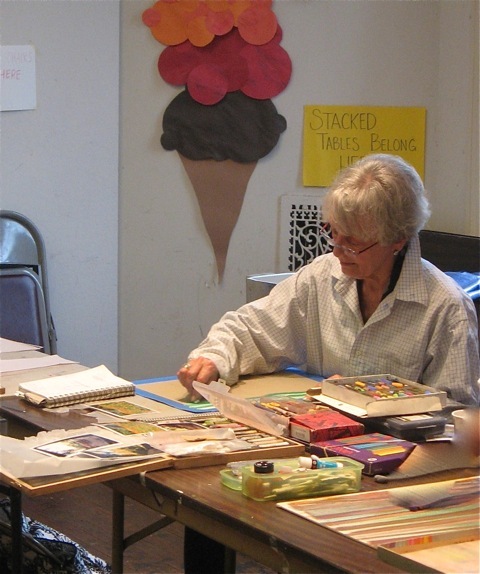 For an illustration of fireworks in Shoo!, Anne pulled out a painting she had made in the Wednesday Studio several years ago, when Gina Clapp had taught everyone the watercolor pouring technique. It was easy to superimpose the black Shoo on it–and a handsome crow he is! Lesson learned: Throw nothing away. Fireworks made with watercolor pouring technique. Shoo made the regular way. For the early-reader category (four-to-seven year-olds), the fewer words the better. Never more than 1,000 words (Shoo! is 300). Just as adult novels do, children’s books must have conflict. Perhaps unlike novels, the conflict must be resolved (Pumpkin goes home; Shoo becomes a hero). Never write “down” to kids; they are just as intelligent as we are, they just don’t have the same level of experience. Don’t make grown-ups significant characters–make children (or animal depicted as characters) central. While the reading level must be basic, using simple words, it’s OK to introduce a few complicated words. A main purpose of books is to teach children. Anne took all those lessons to heart. On that last point? Shoo has a raucous voice. Both Shoo! and Missing Pumpkin are available from Amazon. 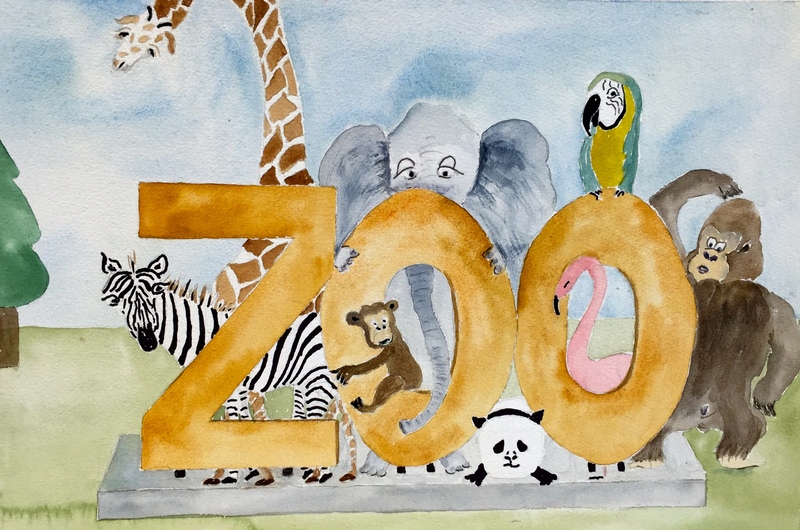 This entry was posted on October 24, 2015 by wisemarian in Illustrating books, Watercolor and tagged Anne Shields, Gina Clapp.